Our hostel is located opposite the Workers stadium in Sanlitun. 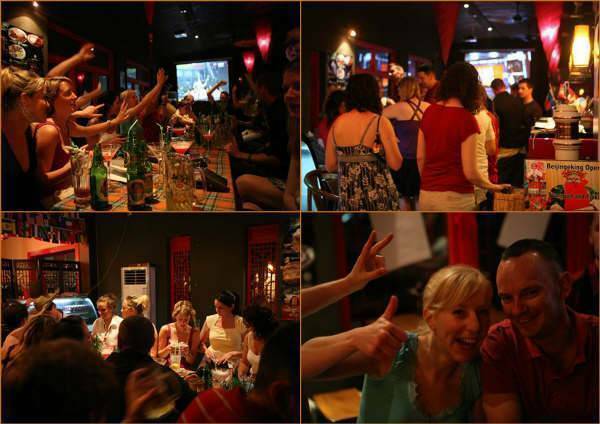 Sanlitun or �Sanlitur� as it is know to the locals is close to the embassy district as well as being in the heart of the bar and nightlife district. Telephones are available in some rooms and there is also Wifi internet connection as well as computer access. Close to the hostel is a post office and bank which makes changing money, withdrawing cash or sending home those bargain gifts you bought an easy process. doubles, triples and ensuites are all available. Despite this the atmposphere in our hostel is peaceful and relaxing, the beds are some of the comfiest in Beijing so we ensure you get a nice nights sleep after a long day exploring the city. There is a chinese cook lessones available on every friday night, that you can learning the typical chinese food from our chefs. The hostel is located opposite the Workers stadium in Sanlitun. next to the famous Yashow market and the embassy district. At our hostel,for western food and coffee with good price. This restaurant has Hunan food,it is little spicy taste. They sales some hangzhou rice noodles,and some of the Chinese Jiaozi. A taxi from Beijing station should take 20 minutes. A taxi to our hostel should cost 40 yuan.